As one might imagine, the cathedral of Milan, the largest cathedral in Italy and the mother church of one of the largest dioceses in the world, boasts a very impressive collection of relics. 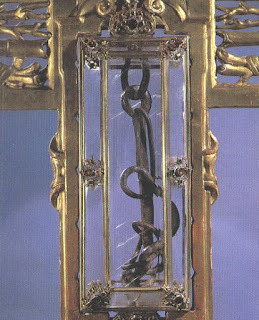 Chief among these is the Holy Nail, one of the nails of Our Lord’s Crucifixion, found by St Helena when she discovered the relics of the True Cross in Jerusalem. According to an old tradition, attested by St Ambrose in his funeral oration for the Emperor Theodosius, the holy empress sent one of the nails to her son Constantine, who had it bent into a bridle for his horse. This was then passed on to his son Constantius, who made his capital at Milan, and by him to his successors, until Theodosius consigned it to St Ambrose at the very end of the fourth century. The reliquary containing the Holy Nail is normally kept in a tabernacle at the very back of the Duomo’s apse, and almost at the ceiling, forty meters above the floor. 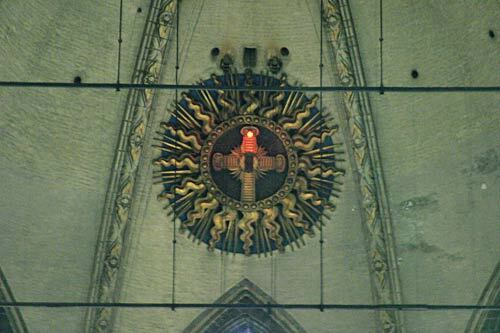 Its place is marked with a red light which burns before it continually, but the tabernacle itself is often difficult to see when the church is dark. However, each year the reliquary is brought down on Sept. 13, at First Vespers of the Exaltation of the Cross, and left for a week in the main sanctuary of the cathedral for the veneration of the faithful. 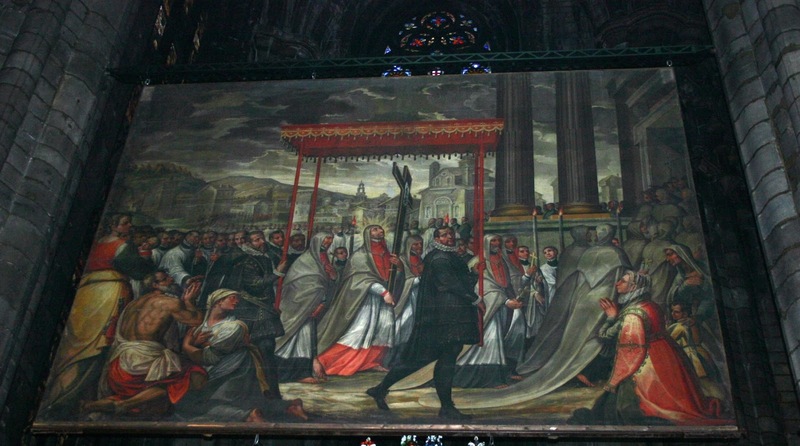 This was formerly done for the feast of the Finding of the Cross as well, which was historically the more important of the two feasts of the Holy Cross. A close view of the Nail in its reliquary. The tabernacle in which it is kept. The tabernacle is reached by a small platform, which is pulled up to its height on four ropes that run up into the church’s roof. Before it was motorized in recent times, the platform had to be pulled by hand by twenty-four men, six to each of the ropes, and with great care to keep them moving at an even pace, lest the platform tip and spill out the archbishop, who still to this day retrieves it personally. (At the end of the week, it is replaced by the archpriest of the Duomo.) This platform, made in the 16th century, is called the “Nivola”, Milanese dialect for “nuvola – cloud”, from the large bag which hangs from its bottom, and is painted with angels. The whole operation can be seen in the following videos, both from the year 2011. The first shows the Nivola being raised and lowered; the second shows the complete ceremony, including First Vespers of the Exaltation, in the OF Ambrosian Rite.